Laundry routine tips that you can try today to make your washing, drying, ironing and putting away go as quickly as possible. This is an amazing collection of tricks that will transform your laundry routine into something that’s a pleasure rather than a chore. Minimise the work, and maximise the time saved doing laundry from now on – perfect if you’re busy and need to streamline things. Let’s face it – laundry is one of those chores that we would happily avoid if it were possible. Laundry is one of those things that keeps coming. We will always need clean clothes to wear! So – what can we do to help ourselves with our laundry routine? What would help to make it go quicker, and more efficiently? I’ve put together this collection of laundry routine tips that will give you inspiration to try something new today. These tricks have the potential to save time AND hassle when it comes to sorting out our washing and making it as streamlined as possible – and I can’t wait for you to take a look! LAUNDRY ROUTINE TIPS TO TRY TODAY! 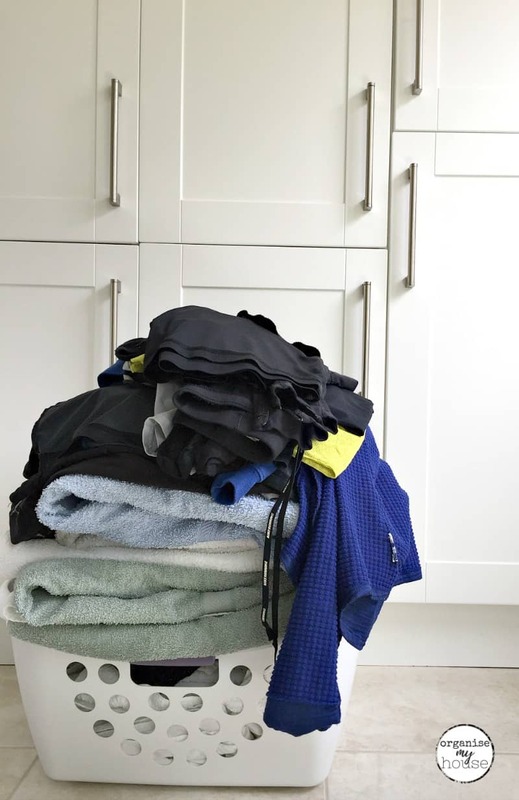 This seems obvious, but having massive piles of laundry waiting to be done (at any stage of the laundry routine of washing, drying, ironing, folding, putting away) can wear on you if you’re seeing it day in, day out. Do things little and often. By this I mean that you can add a load of washing into the machine first thing in the morning, take it out at lunch and put to dry, fold or put in the ironing at team time, and put away after tea. This means you are never spending long going through it, but it’s getting done and you stay on top of things. #2 – DOES IT ACTUALLY NEED WASHING AT ALL? It’s all too easy to take our clothes off at the end of the day and put them into the laundry basket rather than putting them away. And this is the issue. Because we tend to go for the easier option (especially kids), there will no doubt be a proportion of washing each week that really doesn’t need to be washed at all. Why do the extra work? Get into the habit of making everyone really check whether something is dirty or not. Can you get one extra wear out of clothes? Showing children what is and isn’t dirty, and asking yourself each time you reach for the laundry basket will both immediately cut down on your washing loads! As with all things, if you own less, then you have to spend less time maintaining/cleaning/mending them (one of the key reasons to declutter!). …it’s the same with our laundry. To make our laundry routine easier, we need to minimise what we actually have to put through it. – and you will see an immediate different on those laundry piles. TIP – You may want to try minimising each category of item for a month and try it out. If you haven’t missed the extra items, then get rid of them permanently (charity shops would be grateful for these things!). If you think that having less won’t be possible for you – or is one step too far – then the next best thing to this would be the following tip…. If you stop buying things that need specific washing/drying/cleaning done to them, then you will take away much of the hassle of your laundry routine. For example – try washing each persons clothes in a wash that’s just for their clothes – as there will be no sorting to do afterwards. Similarly, if you wash all underwear together, but have everyones in separate washing bags** in the machine, then it’s again easier to sort out. I love this one, because it’s so simple but so effective! That way, any of the same socks will go with each other, and people will know exactly whose is whose. We are all busy, and have different things to do each and every day. As such – you will find that what works for one person probably won’t work as well for you (one reason I don’t promote the same approach for people in this blog). You can see how to create a laundry schedule in more detail HERE – but for this post, when we are talking about simplifying your routine, you’ll want to look at what you do each day, and work out what you can realistically fit in around this. Some days you may be able to do more than others, so it makes sense here to not try and do the same each day because you’ll be left feeling bad on some days, and who wants that? You don’t have to try and do this by yourself, and remember – you are washing for the whole house – so it makes sense that it’s not you who has to do it all. Get kids to help – they love to sort, so why not get them pairing those socks, or sorting washing for the machine etc…? Sounds obvious – but is often something that’s totally missed when we are rushing to get things washed. Firstly – try and get a machine that has a decent size drum – that way you can add in more per wash and get things through the system more quickly. Secondly – FILL THE MACHINE UP as much as possible each wash. The less loads you need to do, the better! If you are needing to dry things quickly – a quick tip is to add a dry and fluffy towel to the dryer with the wet clothes – this will speed up the drying time a lot! A lot of my readers have said that putting clothes away is a sticking point for their routines. This is usually because it’s the fiddliest part of the laundry routine. You have to go into every room, open wardrobes and drawers, and find space for the clothes. Therefore it makes sense to make this as easy as possible, so that it becomes quicker. Give kids drawers that are easy to open with space for putting their clothes away easily. They should be low down so they can reach as well. You could add baskets to a drawer so they know where to put things as well, and hooks are great for children to quickly hang clothes up. Dry clothes on hangers or iron and put on a hanger straight away – so you don’t have to do this extra step when you reach the wardrobe. Get each person to put their own clothes away – have a basket for each and put any clean washing in that basket each day. 11 laundry routine tips that will tame that schedule once and for all, and keep the laundry from ruling your life.